and is simple and valuable. Using the amazing Color Hue, you generate your own personalized color analyses to help with picking out clothing, make up, home furnishings and more. LOVE LOVE LOVE this! Who doesn't love a delicious cup of hot cocoa? It's fun to mix it up every now and then: try adding a pinch of hot pepper; vanilla; cinnamon; or for a really decadent cup - melt a half of a Hershey's chocolate bar in it! Nothing like a good foot massage! I found a place nearby that offers a 1-hour reflexology massage for $35. Can't beat that! Foot massage is one of my most favorite things in the world. Now, if I could be eating chocolate WHILE having my feet rubbed, well I might just die from happines. Mmmm, I want that hot cocoa NOW! I'm also enjoying the happy colours and the thought of a great foot massage :) Hope you're having a happy Friday too! I love hot cocoa Denalee, that and apple cider. In fact tonight I think i will make apple cider for me and my husband to kick start the weekend! i'm too ticklish for foot massages, but i do love a good cup of hot chocolate! thanks for visiting my blog and i love your beautiful silver strands. they are truly lovely! Pretty...pretty colors too! Have a happy weekend! That is a GREAT deal on reflexology. NICE! Happy weekend! 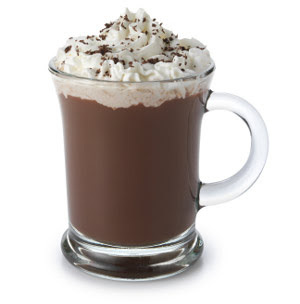 cocoa sounds SO good right now! we're freezing in Michigan! oh wow, my feet are all tingly thinking of someone massaging my feet. Would be wonderful. guess I'll have to do the color test....but I never seem to 'stick' with RULES. oh, and a cup of hot chocolate (with a little mint in it) would be great during that foot massage. oh and speaking of that. do you want to hear something interesting. Especially since your mother had cancer. A friend of a friend of mine was getting a massage and when they touched a certain area on her feet she winced. The therapist said that could be a sign of something else and go see her doctor. and ya know what....he discovered breast cancer, caught in time. You should do like Oprah and start passing this stuff out to your readers. I think my feet would qualify for hazardous duty pay if I were to request a massage.